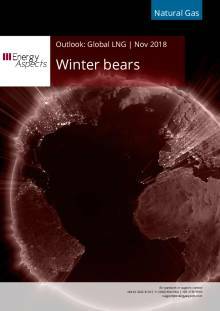 A bearish storm is brewing over the global gas market. First, three new supply trains are on the verge of starting up, with the 4.5 Mtpa Corpus Christi T1, 4.5 Mtpa Sabine Pass T5 and 5.5 Mtpa Yamal T1 all promising to add supply in Q1 19. Second, a mild start to the heating season in NE Asia married to heavy Asian winter buying over the summer is helping keep stocks healthy, leaving little current demand for spot cargoes. Third, the oil price has repriced downwards, dragging contract gas and delivered coal prices lower. The JKM curve has dropped in price over November, taking peak winter contracts below 10 $/mmbtu after having spent most of Q3 18 trading around 13–14 $/mmbtu. The gas price weakness, combined with persistently high freight rates closing in on 200,00 $/day, has meant that the market is now looking to encourage shorter journeys—leaving LNG from Yamal in Europe, discouraging EU reloads and generally pushing more LNG into Europe. The bearish storm is certainly colouring views for Q1 19. However, there is still uncertainty around JKM price direction. The directional pull coming from the oil price is looking highly uncertain. The upcoming OPEC meeting in early December could trigger a repricing upwards if there is a deal to cut oil production, but a further fall in price could happen if there is no announced deal. Weather is an uncertainty for gas markets. and there is still plenty of winter left to go. While forecasts are for mild weather in NE Asia for the start of December, a sustained cold period at some point will realter expectations of balances. In summary, JKM prices will be heading south in a world of low oil prices and warm NE Asian winter weather, but the opposite holds true if oil and coal head back up and the weather turns colder. In this Outlook, we look ahead to 2020 and conclude that if any year in the next five years is going to be soft, it is likely to be this year. As always, much depends on the outlook for China. However, very little additional Chinese regas capacity is set to come online between now and the end of Q3 20, so demand from that country will likely be blunted by capacity constraints. 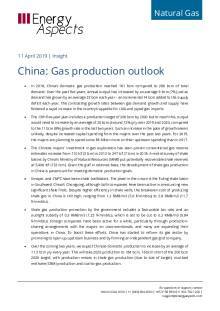 This means we expect Chinese LNG demand growth to only come in at an incremental 18 Mtpa higher over 2019–2020. For demand growth to be higher, more regas capacity will need to come online earlier than currently expected. We also see a dearth of additional LNG demand coming online outside of South Asia, as any momentum to roll out LNG has slowed because of current high prices for the commodity. Latin American demand looks weak, largely on rising local production (Brazil pre-salt, Argentinean shale and US shale piped to Mexico), while MENA demand is dropping hard on Egyptian gas production. Even in South Asia, a slowdown in the development of regas projects in both Bangladesh and Pakistan will limit growth into 2020. While India is seeing more regas capacity online, the speed of ramp-up still largely depends on downstream pipelines being completed. All of this does mean an increased share of global LNG should go to Europe, which in turn means that the spreads between the JKM and the TTF should narrow. As such, the summer 2019 and summer 2020 spreads should come under continued pressure to narrow to the point where most spot LNG cargoes from the US are directed to Europe. For this to happen, the spread will need to be well under 1.0 $/mmbtu, provided shipping day rates drop back to 100,000 $/d. We have already seen the spreads narrow for the summer contracts below that level, pointing to softer global balances.